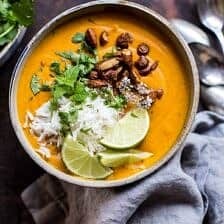 Creamy Thai Carrot Sweet Potato Soup. Look, I am really sorry to everyone who is still experiencing hot weather, but up here in the mountains of Colorado it is fall, and I am embracing it! 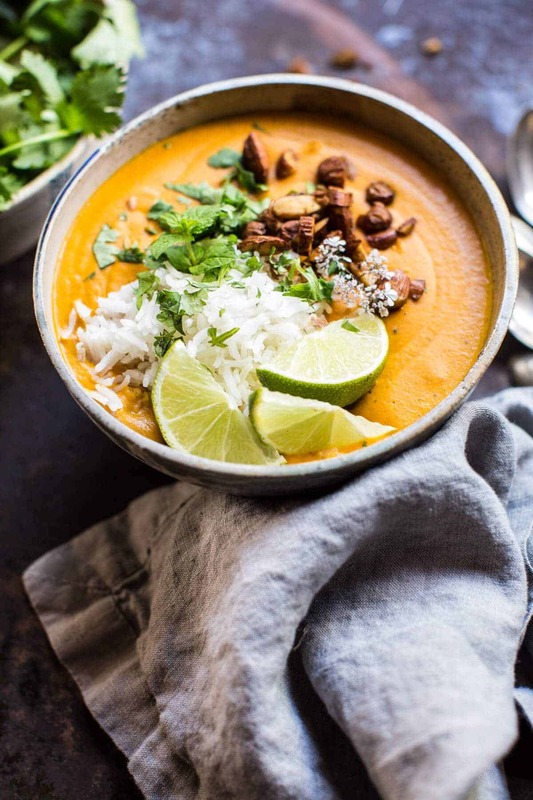 OK and maybe I just could not wait a day longer to make this Creamy Thai Carrot Sweet Potato Soup recipe. So “souper” exited about it! The recipe comes from Angela Liddon and her new cookbook, Oh She Glows Every Day. Some of you may know her better as the writer behind the blog, Oh She Glows. If you’re not familiar with Angela and her blog, I highly recommend checking her out. She focuses on vegan eating, but you guys, I promise every last one of her recipes is beyond delicious. Beyond, meaning just so good and so healthy, like for real. She’s sounding kind of amazing right about now, huh? Well she is! You know what’s really cool though? Before I started Half Baked Harvest, Angela’s blog was the very first I had ever read. Back in the day (think middle school) I went through this crazy phase of trying to get my family to eat healthy things like vegetables, soups and quinoa. So I turned to Oh She Glows for her amazing recipes and photographs, I remember just being in awe of her. Therefore, I could not be more excited to be sharing her new cookbook with you guys today. YEAH! Like happy Tuesday, right! PS. These pumpkin butter oat squares are one of the first recipes I ever made of hers… so good! When I received Angela’s cookbook I was semi-overwhelmed with trying to pick just one recipe to share with you guys. I mean, the book is packed with amazing food. The prettiest and most colorful salads, smoothies, grain bowls, soups and desserts. It honestly has everything! 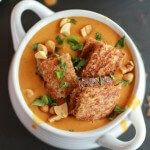 While choosing just one recipe was crazy hard, I had a pretty good feeling about this Thai Carrot Sweet Potato Soup. It has everything I love, and this time of year always has me craving soup, so creamy Thai soup it was! Umm, you guys?!? Such a good choice. Not only is this soup incredibly delish, it’s also so easy to make, and ahh, there’s not even an ounce of cream! Wait, what? Yes, totally serious right now. SOOO GOOD. So what is the secret to this super creamy, creamless soup?! Almond butter! Ok, and obviously the sweet potato makes it extra creamy as well, but I think the almond butter is the true secret. How good does that sound? Normally when making something Thai, I usually reach for peanut butter, but almond butter is genius! 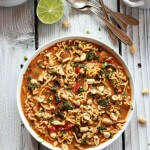 It’s a little mellower in flavor, so it lets the flavors of the Thai curry really shine through. 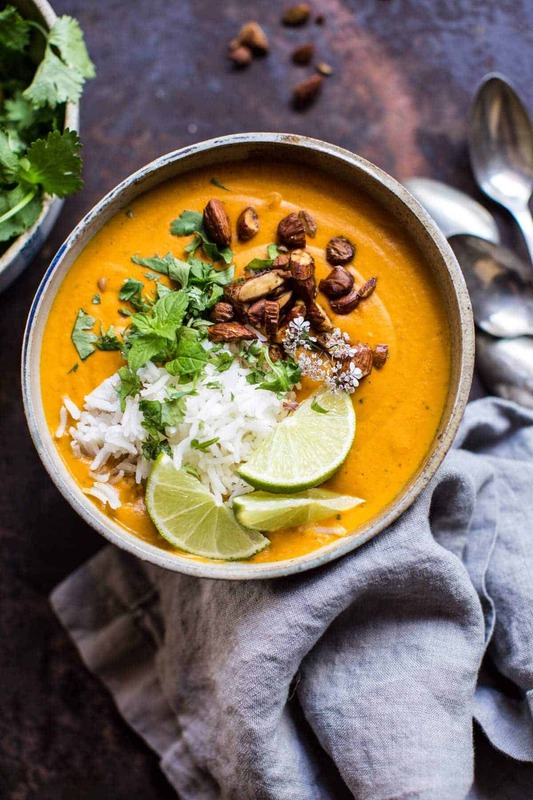 Top the soup with tamari (gluten-free soy sauce) and roasted almonds, and it’s autumn soup perfection! In all seriousness though, this soup is truly so good. It’s warm, cozy and healthy, which is probably the greatest combo ever! 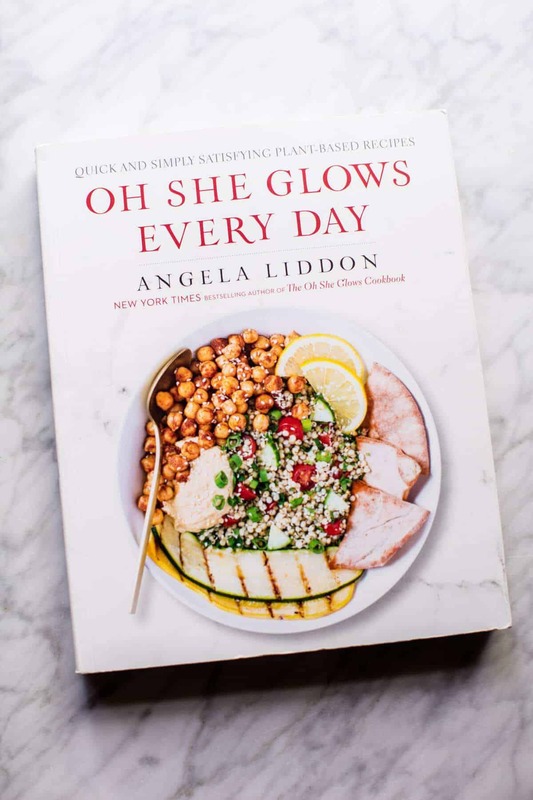 If you guys are interested in vegan or gluten-free cooking and baking, please check out Angela’s new cookbook, Oh She Glows Every Day. Even if you’re not vegan, it’s just an all around great cookbook, and this is coming from someone who loves cheese! ? The recipes are super reader friendly. I bet you’ll even be able to get your meat loving boyfriend, husband or whomever, to fall in love with Angela’s veggie burger… so good! Okok, so bottom line for today though? Soup tonight! Or at least sometime this week, because Thursday marks the official start of fall, and as if you couldn’t tell, I am pretty darn excited about it. Not only is this soup incredibly delish, it's also so easy to make, and ahh, there's not even an ounce of cream! In a large pot, melt the coconut oil over medium heat. Add the onion, garlic, and ginger and sauté for 5 to 6 minutes, until the onion is translucent. Stir in the curry paste. In a small bowl, whisk together some of the broth with the almond butter until smooth. Add the mixture to the pot, along with the remaining broth, carrots, sweet potatoes, salt, and cayenne (if using). Stir until combined. Bring the soup to a low boil over medium-high heat and then reduce the heat to medium-low. 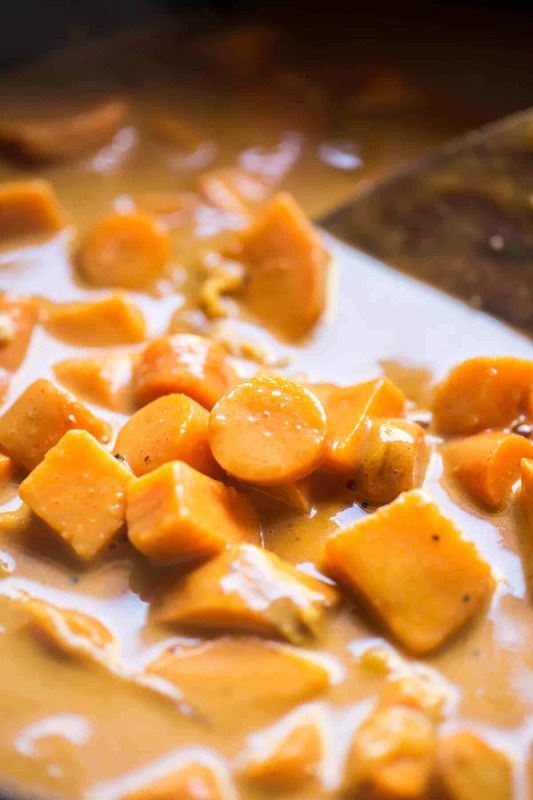 Cover and simmer for 15 to 20 minutes, until the potatoes and carrots are fork-tender. Return the soup to the pot and season with salt and black pepper. If desired, you can thin the soup out with a bit more broth if you prefer a thinner soup. Reheat if necessary. Ladle the soup into bowls and top with minced cilantro, almonds, and a squeeze of lime juice, if desired. The soup will keep in the fridge for up to a week, and freezes well for 1 to 2 months. Preheat the oven to 325°F (160°C). Line a large baking sheet with parchment paper. In a medium bowl, toss the almonds with the tamari until the almond pieces are fully coated. Spread the almonds over the prepared baking sheet in an even layer. Roast the almonds for 9 to 12 minutes, until lightly golden. The tamari will have dried up. Let cool completely on the pan. The almonds will harden up as they cool. 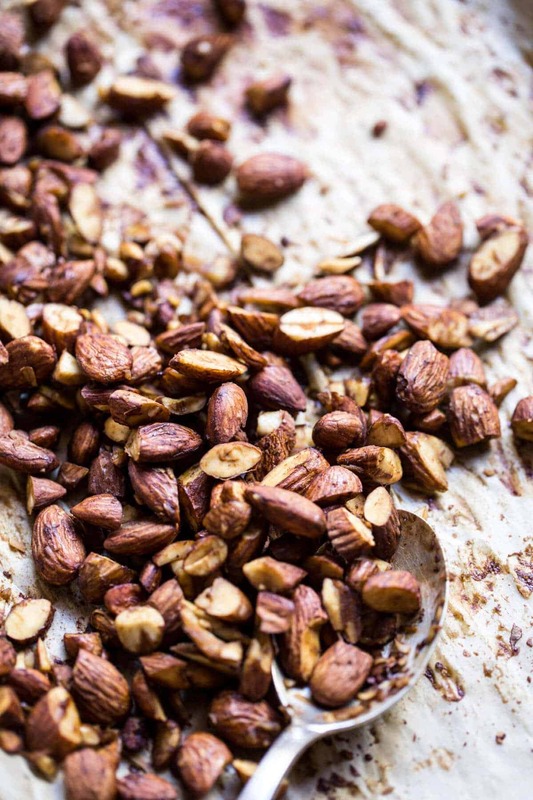 Using a spoon, scrape the almonds off the parchment paper and enjoy! Leftovers can be stored in an airtight container at room temperature for a couple of weeks. Smoky Pumpkin Beer and Cheddar Potato Soup with Candied Bacon Popcorn. Maple Cream Sweet Potato Soup with Cheddar Cinnamon Sugar Twist. 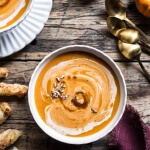 Almond butter in soup is such a great idea. And what is it about carrot soup that it can be made in so many different amazing flavours so that it is totally different every time?? I will have to check it out! Thanks Rachel! You totally convinced me to buy that cookbook ? I love soup, always have soup ready for our meals, and my son particularly looves pumpkin soup!! Ah, yes! Pumpkin is possibly me favorite!! I love soups but I need to have things in there if that makes sense. I would need to add some vegetables. You totally should! Vegetables would taste so good with it! Thanks Nancy! This looks delicious, I’m going to make this soon! I think I’ll roast the carrots and sweet potato for even more deliciousness! That will be amazing!! Let me know how it goes!! I do love how much you love Autumn, it makes me giggle! I love a good soup and this one looks delicious! Beautiful photos as always! Haha! Its just so pretty!! Good morning. Am missing something? What is the white ingredient on top of the soup? Carrots still in the garden.. so this will be my first dishes using them. Thanks for the recipe – I will have to add the second book to my collection. Finally, fall has arrived and your soup is an excellent introduction to “spoons” time ! And again, yes, your photos are amazing ! SO happy about Fall!! Thank you so much!! I desperately want that cookbook! That soup sounds AHHHHMAZING. I love anything Thai scented! Ah you and I both Jessica!! Thank you!! This soup looks so good! I could totally imagine a red lentil or a rice noodle situation going on here. Oh my! that sounds delish!! The soup looks wonderful. The raw almond butter does it add thickness to the soup. I have an allergy to nuts. Is there anything I can replace it with. It’s soup season! I love that you used a combination of sweet potato and carrots to give the soup a natural sweetness. And I can’t believe there’s no cream in this. Looks super creamy and delicious! I cant wait to make this! Looks so great! Hope you love it!! Thank you! This was one of the first recipes I made from this cookbook. It is awesome and my whole family loved it. My husband and I both thought, “this will be our new Christmas meal soup”, it really is that good. I have also made several of the other recipes from her new book and everything has been simple and delicious! Both of her cookbooks sit on my counter as I am always using them! Thanks for sharing this recipe with your readers! I can’t wait to add your cookbook to my counter too?! Something wonderful for the coming colder days of fall…I have all the ingredients so I’m going to give this a try. 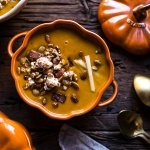 I love the bright colors of fall foods, and this soup is no exception! I like hearing about your baby goats. I’ve been following along on IG hehe. Yes they are so fun (the goats and fall food!!) Thanks Natasha! Wow love that fall color! 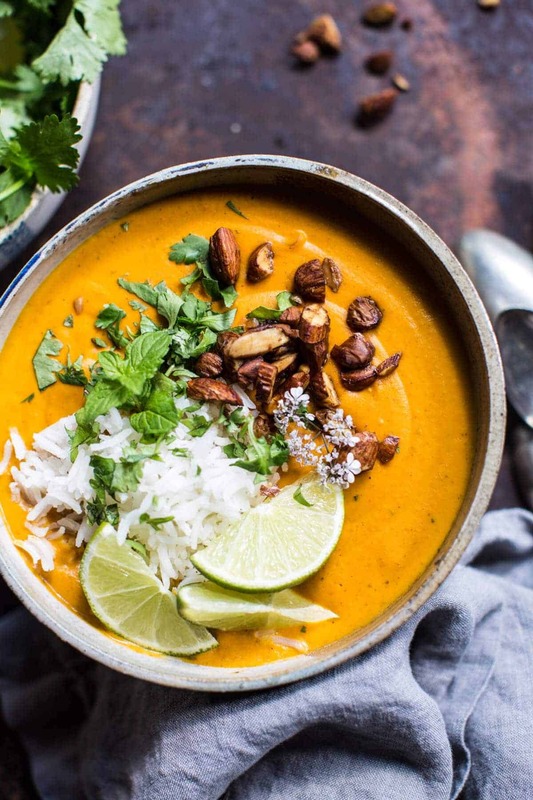 When our temperature here cools down, I will definitely try this beautiful soup. I can’t wait to making soups and stews and all the comfort food! 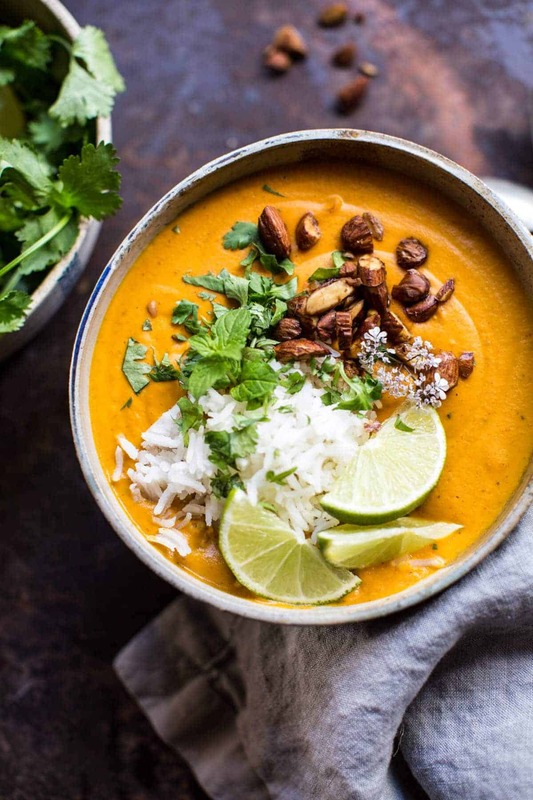 But he adds coconut milk instead of almond butter and sometimes sweet white miso and pumpkin or squash or just carrots are also good instead of sweet potatoes!! Great substitutes! Thanks so much Holly! Just finished our bowls — Major league-tasty-goodness! Cannot wait to make this soup again. Thank you! YAY! This is so great, thanks Michael! MUST MAKE!! And purchase this cookbook. Sounds delicious!! Thanks so much Olivia!! It’s wonderful that you’re sharing a completely vegan recipe! Angela is such a talented blogger and chef, so I could imagine that her latest recipe book would be abundant with amazing goodies! Can I use something in place of the curry paste? I can’t find it. I have curry spice…..
Hi! 2 teaspoons of curry spice will be great! Let me know if you have questions. Hope you love this! Any idea how long you’d cook this for in a Slow Cooker? Maybe 3 hours? Low or high? Easy to make and oh sooo delicious!